Wonderful! Glad to help! 🙂 History can be useful for other things besides reenactments then! 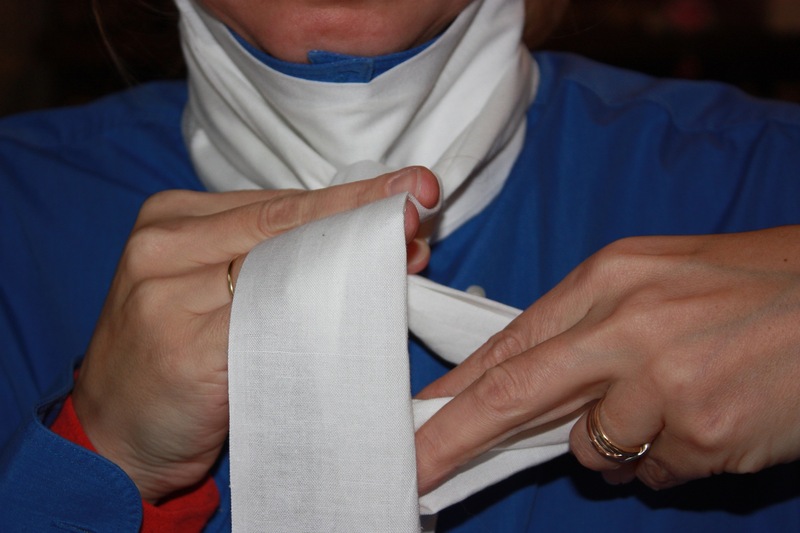 Yes…but reenactments are such fun! Reenactments ARE fun, aren’t they! You have no idea on how many websites I’ve search for this! Congratulations! 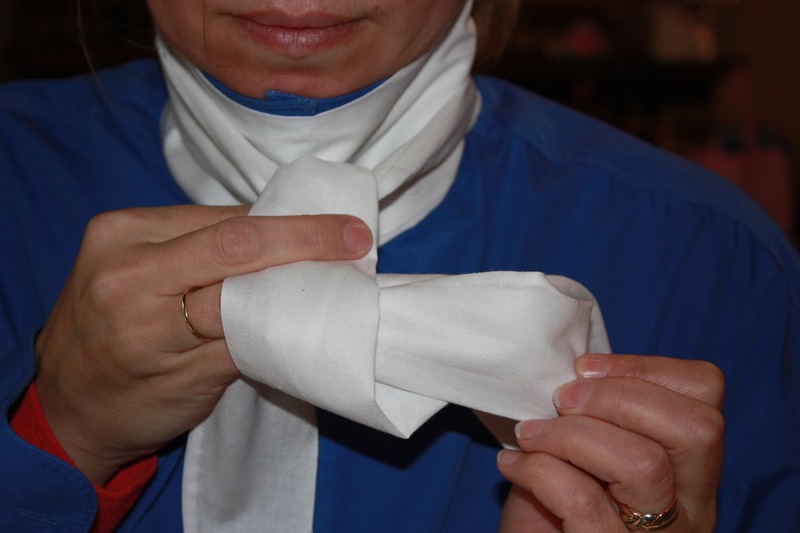 I found the very same problem when I was trying to learn how to tie a cravat. 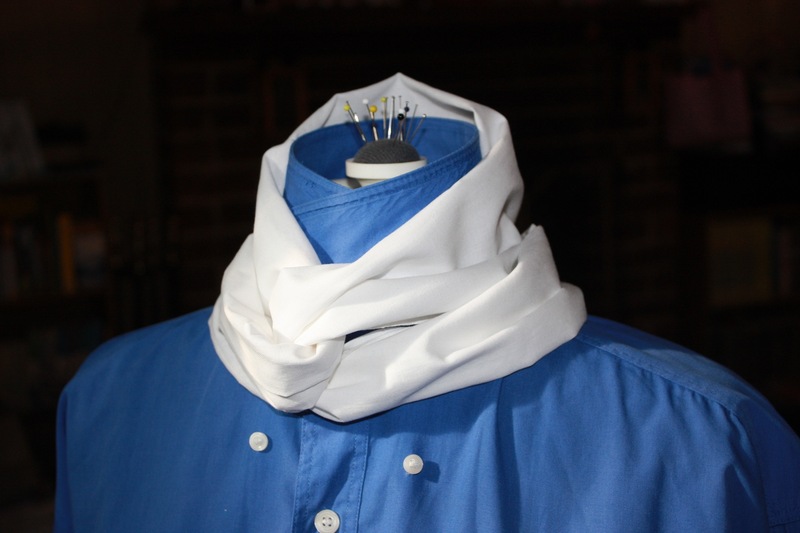 It was a You-tube clip on tying a Victorian cravat that helped me see how it was done. 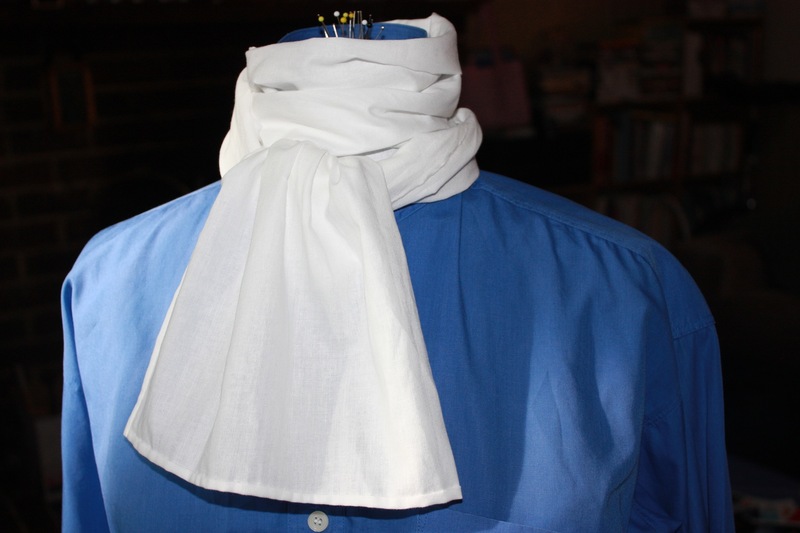 Is there anywhere one can buy a cotton or linen cravat with the correct dimensions to make these cravats please? I tend to buy most of my costume stuff (the stuff I don’t make, that is) online, as I find it difficult to find this sort of stuff in the shops in my local area. Or else, you can just buy a length of the material you want in a fabric store and then pay someone (like a shop that does clothing alterations) to hem it to the right dimensions. 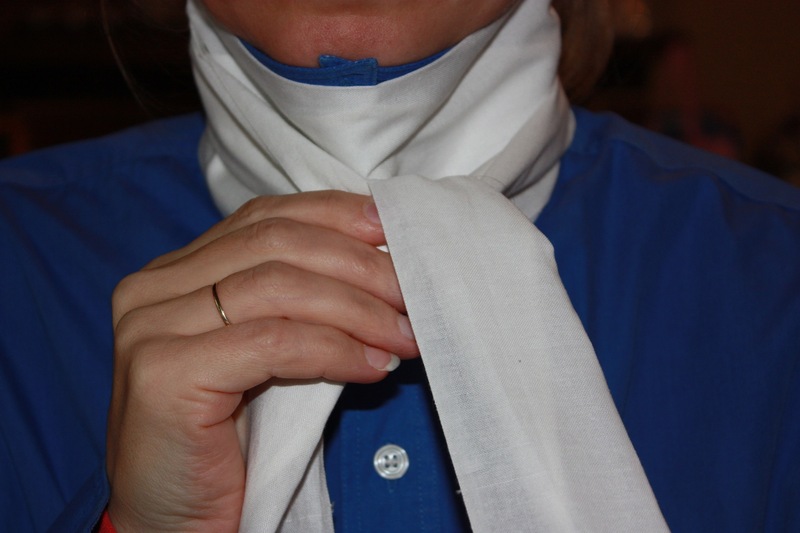 Even a plain white ladies scarf would probably also work just as well, even if it is not cotton or linen. Hopefully these suggestions are helpful! 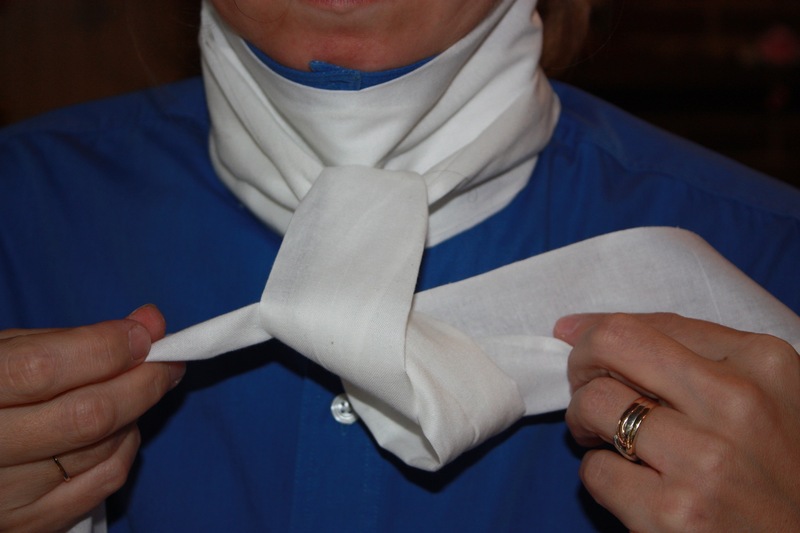 I happened upon you blog because we are having old fashioned Sunday at our church and my husband is dressing like a colonial…I grew up doing French and Indian war reenactments so I should have known how to tie one of these because of my dad wearing his….now I know how to tie his neck cloth! 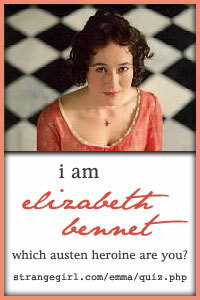 Thank you for posting this….love your blog-so neat! No worries. Glad it helped you out. Have fun dressing up! 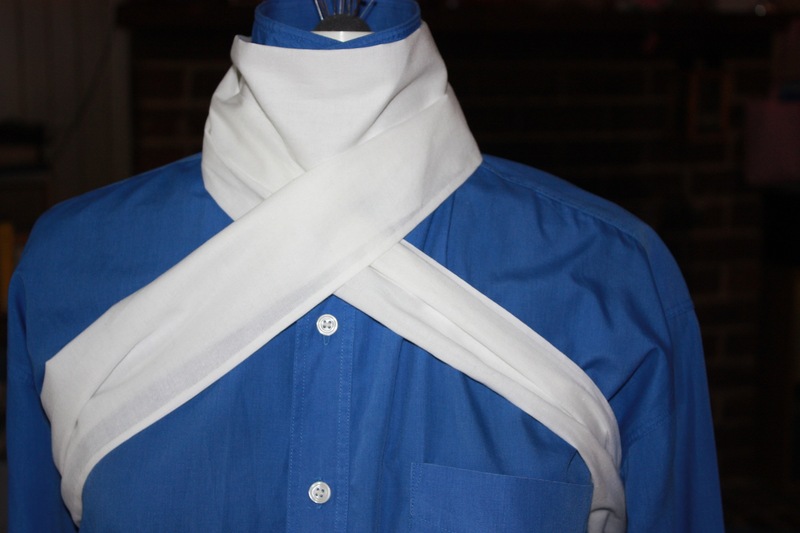 Yes, I am sure that neckties were not always just about “fashion”, but also about practicality too. Linen was used so much during the 17th and 18th centuries for exactly those properties you describe: sweat-absorbing, cool in heat, warmth in cold. Hi Tea in a Teacup! 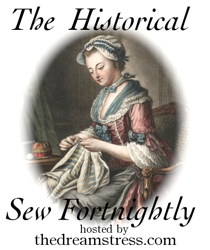 Wonderful site about the dress of yesteryear, especially the step by step photos and instructions above on the basic knot! 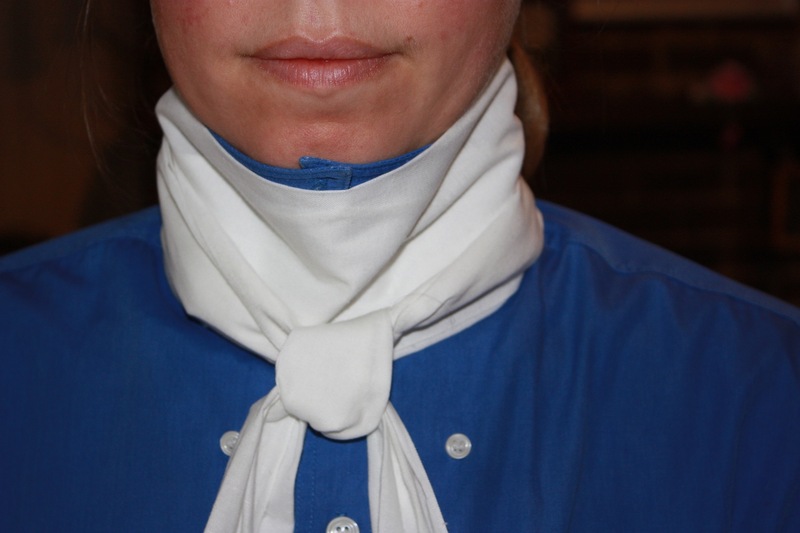 Considering there is not much out there on the internet about actually tying the various cravat styles, would it be possible to include more step by step photos and instructions on the other various knots above, for example the barrel knot and the mathematical knot? They are photographed, but not showed how to do them! 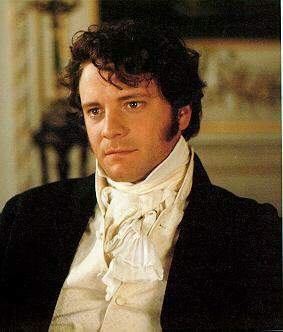 I’m sure many, especially those like myself who attend Regency and Victorian events, would love to know how to be able to tie those different cravat styles/knots. It is hard when there is not much instruction to find out there, isn’t it! 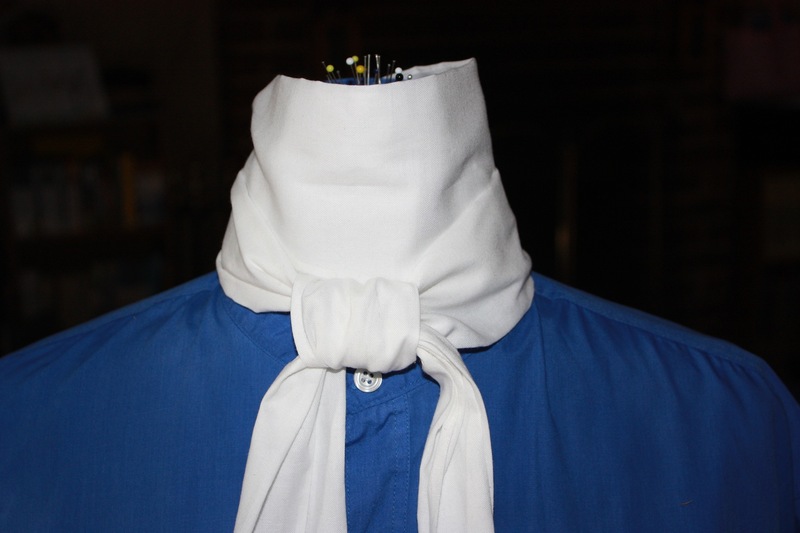 One thing I found when learning how to tie these cravats is that most of them are all essentially tied the same way. 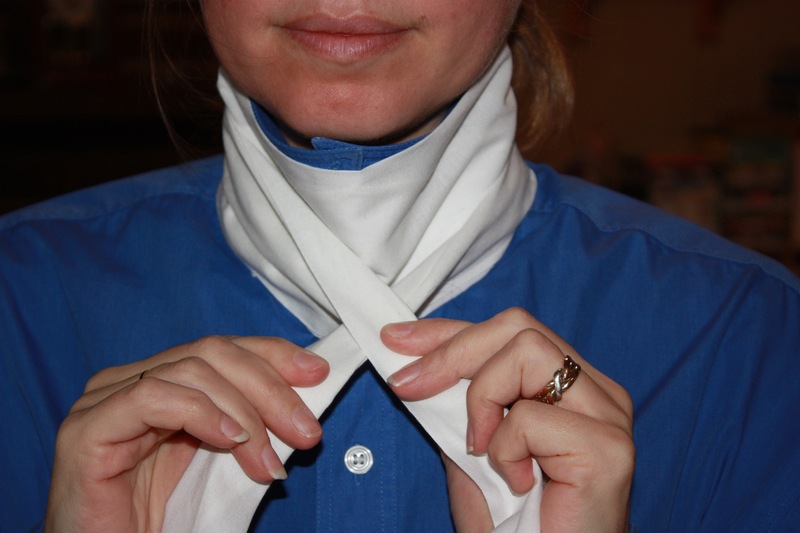 The main difference is in how wide or tight the knot is or how high the cravat sits or what sort of “creases” are in the neck area. I ended up only illustrating those ones that were substantially different in “tying-technique”. The Mathematical knot is achieved in exactly the same was as is illustrated. 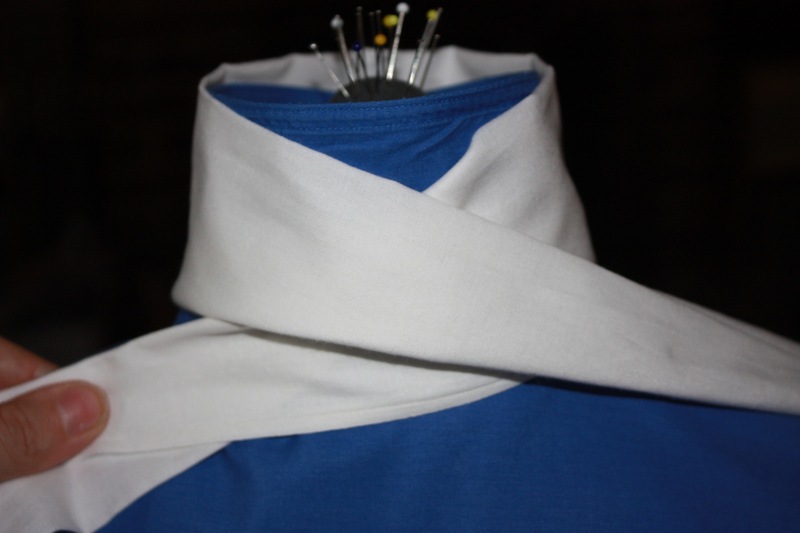 I would experiment with the Mathematical and the Barrel, as the barrel appears to have the same tying-technique but needs to be worked with the fingers to get a much flatter and wider knot.